There's no one right answer to this question: The answer depends on what kind of pack you have and where you're going to hike. General principle: lighter-weight items go at the bottom; heavier items at the top and close to your body. However, if you are going to be scrambling or hiking off-trail on rough terrain or snow, you might want to pack some of the heavier items a little lower to bring down your center of gravity. Clothes go in next. But it's a good idea to stash a few of your warm clothes¡Xhat, gloves, and an insulating layer¡Xand your rain gear in an outside pocket where you can easily get them. Tents and tarps. There are a couple of choices for your tent or tarp. Most packs have a separate compartment (where the sleeping bags go) that is accessible via a zipper: If your pack has such a compartment, see if you can stuff the tent under your sleeping bag. That way, you don't have to unpack everything to get your tent out if it's raining when you want to make camp. This placement also works for packing a wet tent because it won't drip over everything (Be sure, however, that the tent and sleeping pack are in waterproof stuffsacks). Tent poles go strapped to the outside: Tie them on tight! Food, fuel, and cooking utensils. Try to store the fuel upright and away from your food, in case of an accidental spill. 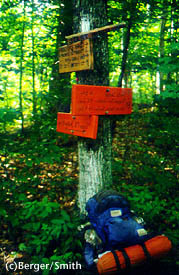 Many hikers put their bottles in an outside compartment. These items can have hard edges: Be sure they're not poking at your pack. Personal items. Squeeze these in wherever they fit. Outside compartments. Use these for items you'll need during the day: Rain gear, a few warm clothes, pack-cover, water filter, water, lunch, snacks, TP, sunscreen, mosquito goop, and your camera. Mattresses. Most hikers roll up their sleeping pads and strap them to the outside of the packs. Some smaller mattresses fit inside a backpack, where they are better protected from accidental encounters with cactus needles and barbed wire fences.